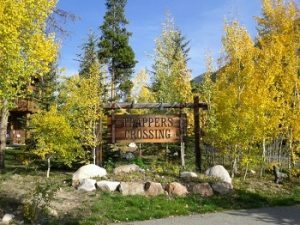 Trappers Crossing Condo is located along the Snake River in Keystone, Colorado and are some of the most private condos in Keystone CO Real Estate. Located less than 2 miles from the base of the Keystone Ski Resort and River Run where you can shop, dine and be entertained. Trappers Crossing Condo was built between 1996/1997, there are a total of 36 condos broke down into 6 – 1 bedrooms, 24 – 2 bedrooms and 6 – 4 bedrooms. When you own or are a guest at Trappers Crossing you have use of the pool, hot tub, sauna and steam room in River Run at the Dakota Lodge. Some condos have their own private hot tubs on their decks that overlook the Snake River. If you don’t want to drive to the Keystone Ski Resort or to River Run to use the amenities you can also take the free resort shuttle from Trappers Crossing. These are some of the best condos in Keystone Real Estate, located not to far from the slopes yet private and secluded along the Snake River. Not sure where in Keystone you would like to own, search all condos for sale in Keystone CO with us and arrange a private showing today.